Excluding visits, normally business related, to the Counties of Merseyside and Greater Manchester, until 1974, a part of Lancashire, my ‘experience’ of this county, probably like that of so many, has been limited to the M6 motorway! So you can imagine my surprise when I discovered the glorious country which is the Duchy of Lancaster…owned by Her Majesty. Here are high rolling grass covered hills which cover vast tracts and the scenery and vistas reveal a completely inspiring panorama, but with the Pennine grey cloud swirling, there was an autumnal feel to my August arrival and a damp atmosphere which suggested rain was not far away. I was headed for Whitewell, or more specifically, ‘The Inn at Whitewell’. 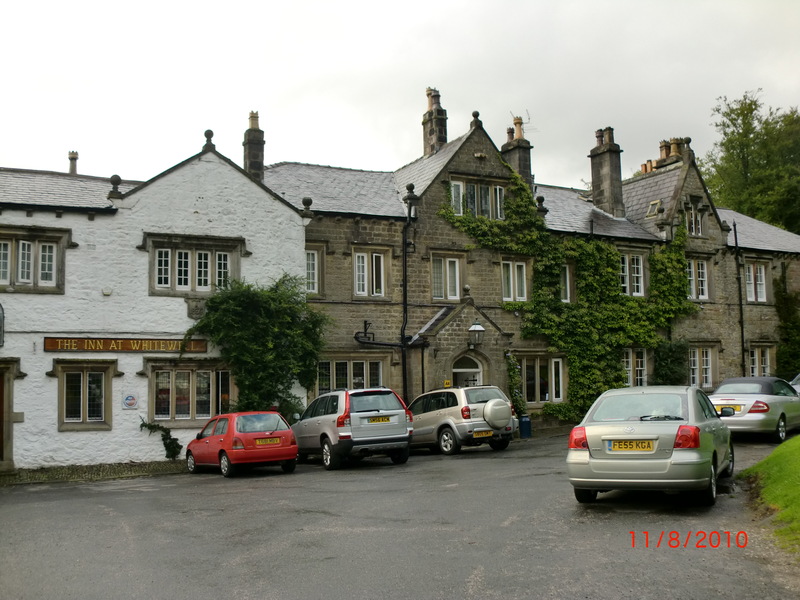 This is a traditional and very comfortable and popular hotel in the middle of ‘nowhere’ and serving delicious food, and has a well stocked cellar. Peter Ward is a drinks industry veteran of great renown, but more recently, having bought Burtonwood Brewery, a major independent contract brewer, and probably the best producer/bottler of beers and products in typically beer containers. He is also a colleague on the Court of The Worshipful Company of Brewers, and supplier to one of my ‘client’ companies. So, it was not too difficult to arrange a strategic review, and business opportunity seeking session…but only after the rise was over! And, Peter has thirty years experience of these waters, and there could be no better guide, as he proved to be. Through crab salad lunch, Peter was enthusing about the prospect of rain. For he is as passionate a salmon and sea trout man, as I am about browns, and he knew that freshwater would encourage them to move. 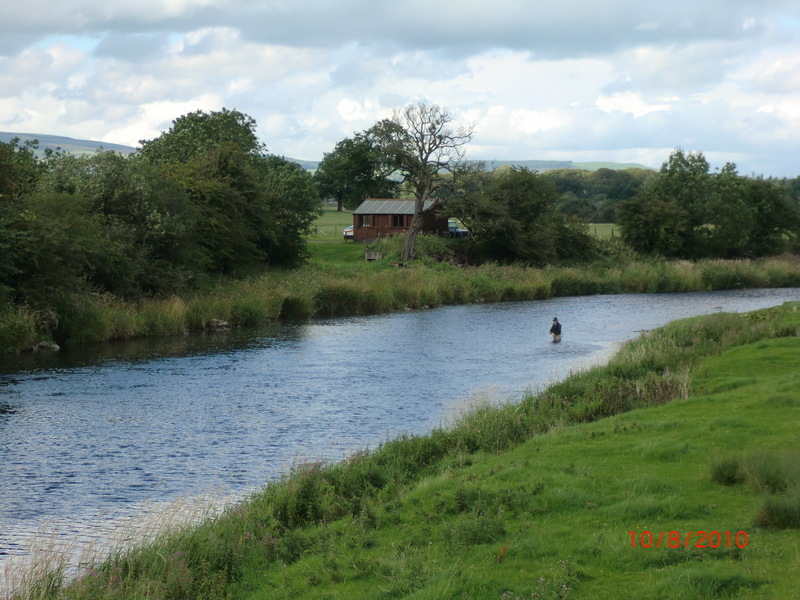 The Edisford Hall Fishing Syndicate has water at Great Mitton which is owned by a Bury businessman and has 40 members. The river here is 15 miles from the sea, it is 120ft wide, rock and pebble bottomed, wade-able, and the water is peaty brown. The fishing book advised that this week (and it was Tuesday!) a salmon, as well as a sea trout, browns and grayling had been caught by the three members who preceded us. 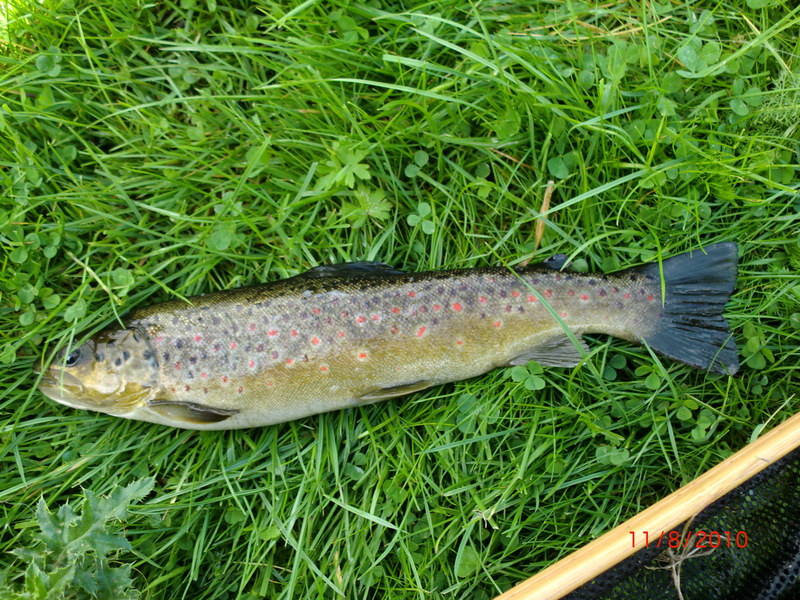 Peter was seeking sea trout fishing light with a Butcher and netted two browns. Fishing down the pool in blustery winds which made casting difficult, I had pulls, but was fishing more delicately (my 5 piece Greys Missionary 8’ 3” 5wt) with a spider on the dropper and bead head PTN on the point. But the real excitement was to see seatrout leaping and splashing noisily in the margins….in daylight! 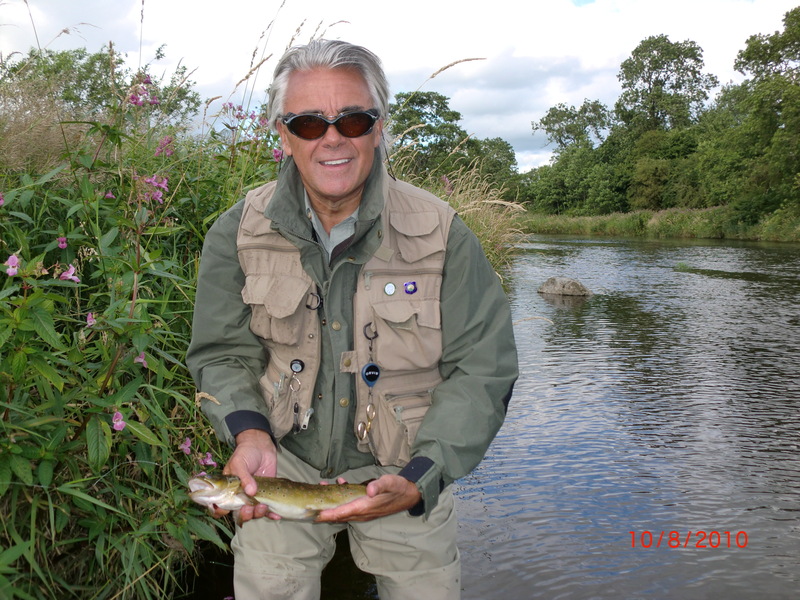 Peter, trying very hard to help me net a Lancastrian trout, suggested we moved upstream to fish the Bridge Pool. The ‘bridge’ is an extraordinary construction over which is laid four pipes of 36” width, within which is pumped enough water to furnish the needs of the whole of West Lancashire. The bridge is a major concrete build, and goodness knows what it cost….it is the size of a cross motorway bridge…and as Peter alluded, “why is there no walkway across it for we anglers?”, for it is surrounded in fencing and wiring. But, above it, and armed now with one of his Butchers, and a convincing “there is one in front of that rock”, I cast a couple of tiles, and wallop!! “I told you” Peter shouted, excited, that my mission, which he bought into with such enthusiasm, was about to be accomplished. And after a good struggle, a brown of about1 1/2lb was netted, by him. And we discovered that whilst the Butcher may have been the attractor, he took the yellow spider on the dropper! Hard work, but good fun. And so back to the Inn for some serious business! 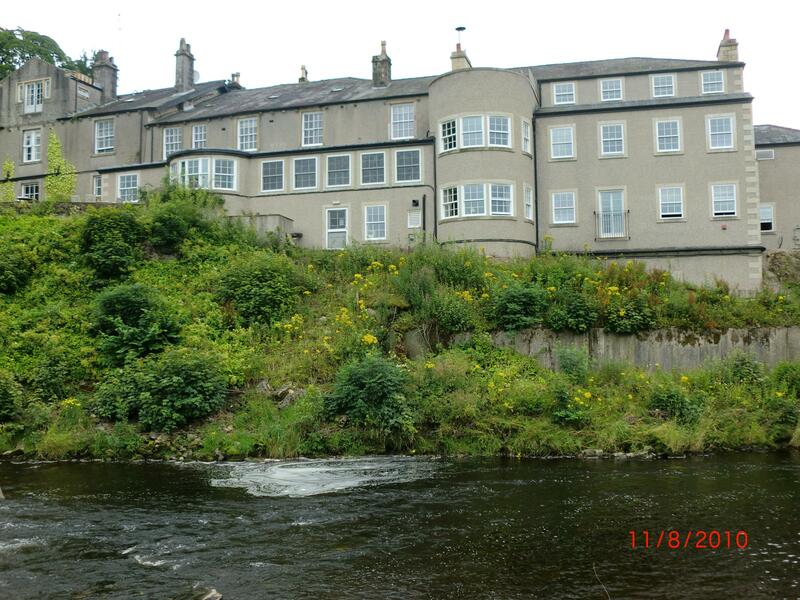 The hotel offers day tickets to residents, for a reasonable £30, on its eight miles of river. The river is reservoir fed and holds it height with good water management, and in spite of rains, was clear, and peaty in colour. Having ‘broken my duck’ yesterday, I was happy to follow Peter’s lead this morning and do something different (for me) and try for a sea trout. Suitably Buthcher-ed and protected from the early day drizzle, we walked the beat and Peter generously put me onto a stretch where has had success, and where there was a report of a salmon, just yesterday. The wading was complicated by the colour, and some rocks had to be negotiated with care, with algae adding to their slippery challenge. A pull with my third cast was probably a trout, and casting lazily to the far bank for an hour, I did as Peter advised but to no avail. A solitary kingfisher was my early morning highlight. I was always interested in the run just below the hotel. There was fast water streaming through a narrow run, below and to the far side of which, time had etched out a back eddy where Peter was sure a sea trout or salmon would lie/rest. A rise in the foam was enough to encourage me to detune and with a PTN on the point, and an Usk Nailer (Jimmy would be proud!) on the dropper, I was after, and soon into, browns….five in all. And all were taken from that spot, casting right into the foam, and also just below it, whilst surrounded by the extracted breakfast frying odours of the Inn’s kitchen. Hmmm!! And it rained, again and stopped….and it rained again,(lucky, Peter!) and didn’t, so at noon, and after three hours of fun, it was off to Staffordshire. Peter has fished these waters for thirty years….it shows. I hope we will fish again.